The next day, that is, after the day of Preparation, the chief priests and the Pharisees gathered before Pilate and said, "Sir, we remember what that impostor said while he was still alive, `After three days I will rise again.' Therefore command the tomb to be made secure until the third day; otherwise his disciples may go and steal him away, and tell the people, `He has been raised from the dead,' and the last deception would be worse than the first." Pilate said to them, "You have a guard of soldiers; go, make it as secure as you can." So they went with the guard and made the tomb secure by sealing the stone. Yesterday was a day like none other. Outside the city walls of Jerusalem, a cosmic collision of the temporal and eternal took place, affixed to a cruel Roman cross. In the eyes of some, it may have appeared as the death of a desperate hope of throwing off the yoke of Imperial Rome. To others, it represented the messy death of a wide-eyed troublemaker. Still to others, it appeared as the timely demise of a troublesome meddler who was bent on usurping a culture and religious system. Irrespective a body, now still and lifeless, hung between heaven and earth. The eyes that stare in from outside of our timeline saw something completely apart. To these eyes, there on Golgotha's hill hung the only propitiatory offering that could satisfy a Holy and Just God. Just moments prior, this God-man suspended above the earth cried out "Tetelestai"! The debt for sins ancient and future were paid. The God-man then stepped out of our timeline and willingly yielding his life back into the hands of the Father. Those follower of the master, who hadn't abandoned him, now had approximately three hours to see to the matter and in doing so, would render themselves ceremonially unclean for the coming feast Yet in their devotion, they sought the body of Jesus who might have otherwise been cast into the burning garbage dump outside of the city walls, gehenna. 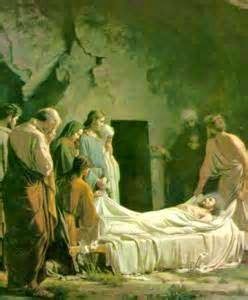 Instead of becoming food for carrion, the remains of the Christ were lovingly laid in Joseph, a leading Sadducee's tomb. A day later, the Jewish priestly aristocracy was nervous. They knew that in spite of the Christ's resounding declaration, that this was far from over. With the Roman governor's approval, the tomb was sealed with the signet of Imperial Rome. This seal was a dire warning to would be hoaxers that should they attempt to steal Christ's remains, they would suffer the same fate as the one lying on the other side of the stone. From the standpoint of the Apostolic band, this had to be a crushing day. One of their own had handed Jesus over to the authorities and was now dead by his own hands. Their "class president" made a profanity-laced denial of their Master and was now living with the disgrace. The rest were hiding somewhere in the city, for fear that perhaps after the feast, they would be next. Yet, we soon learn just how one day changes everything.